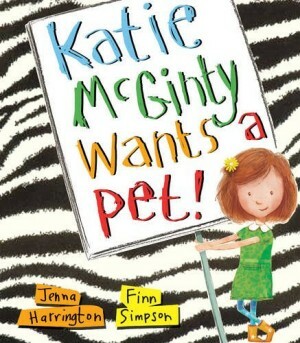 Today Chaos Castle is delighted to welcome Finn Simpson, illustrator of Katie McGinty Wants a Pet, into the courtyard. Finn kindly agreed to an interview on his quick visit. Hello, Finn, thank-you so much for coming to Chaos Castle. We’ve been giggling through Katie McGinty Wants a Pet, and especially love the characters. Did you have an immediate image in your head for the characters, or did they go through several iterations before being just right? When I begin a picture book I usually have an immediate connection with the characters, and in the case of ‘Katie McGinty Wants A Pet’ Jenna’s story is so funny and direct that Colin [the zebra] came to mind pretty much fully formed. The only problem was that his stripes had a tendency (in my head) to change colour, so it was a struggle to keep him black and white. Katie went through a few very subtle changes. Her face and character were there from the start but we played around with clothes and hair, so that she was just right. We agree that she is just right! Do you base any characters on people or places that you know? I’ve been illustrating picture books long enough to know not to base the characters on anyone I know. Ha. That can be a very dangerous thing to do! … Although having said that Katie’s Dad does resemble a very close friend, and one of Hannah’s brothers looks suspiciously like my Godson (but don’t tell anyone). Our lips are sealed! One thing we’re always curious about with collaborative picture books is how much you get to work together. Did you get to work with Jenna whilst illustrating? I only met Jenna once the book was completed and was delighted to discover that she loved the illustrations. It’s always a concern when working with someone else’s story that you get the characters right, especially when it’s the author’s first book, which is always a very special thing. Thankfully, Jenna was very kind and it was a pleasure to finally meet. We agree, Jenna is a lovely lady! She’s not the only one who loves the illustrations, we’re really pleased you were matched together. As Katie McGinty Wants a Pet is about a different sort of pet, we wondered if you could have any pet at all, what would you choose? I think a monkey would be good. Especially a monkey who could cook and dust, possibly one who has a time machine, too. We’re talking about a very special monkey here, obviously. So if you meet one, let me know. We get all sorts of visitors at the Castle, so you never know! Finally, as I know you do have to leave soon, do you have any other books in the works? I’ve just finished a book with the BBC’s own extraordinary Chris Packham, called and we’re about to start a second one soon. But right now I’m illustrating my own picture book. It’s the first one of written and illustrated myself and it’s a really exciting time for me. That is exciting, we look forward to seeing how it turns out. Thank-you so much for visiting, Finn, and we hope to welcome you back soon!